ACTING PARTNER lets actors practice their lines anytime, anywhere and without having to beg a friend to help. Imagine running lines while working out, stuck in traffic on the 405, walking your dog, walking other peoples dogs, relaxing in bed, taking an UBER to an audition, driving an UBER between gigs, even sitting on a folding chair waiting to audition. ACTING PARTNER lets you run your lines over and over again, wherever and whenever YOU WANT and 100% guilt free! Try getting your roomate to do that! Created by the makers of ScriptE (the industry-leading Digital Script Supervision Software), ACTING PARTNER is built on proven technology and backed by superior tech support. ACTING PARTNER is perfect for working actors and aspiring stars alike. Even busy Producers and Studio Development Executives love having ACTING PARTNER read scripts aloud to them. All you need is an iPHONE or iPAD*, the ACTING PARTNER APP, a digital script and a good charge. ACTING PARTNER is affordable, fun and it really works! Simply import a script into ACTING PARTNER. Use the same script import technology used by movie and tv professionals. No need to pay someone else to import your script. 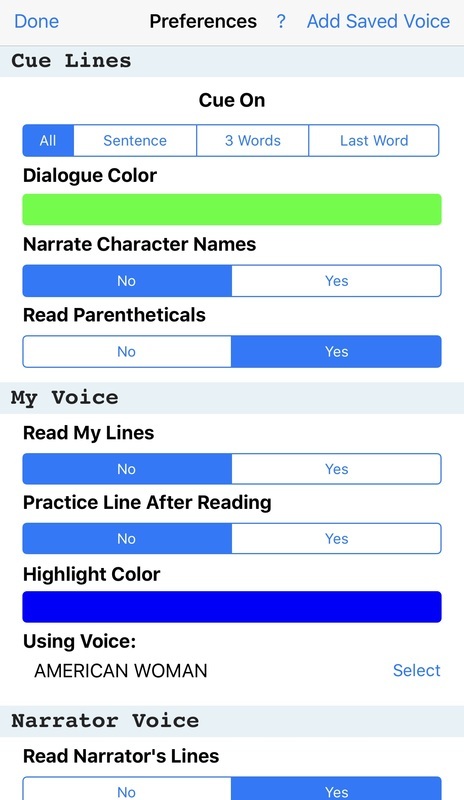 Then, choose from pre-selected character voices or create custom voices, choose your read-back preferences and get to work. ACTING PARTNER can read you the entire script or just your scenes. Identify your character and ACTING PARTNER will create scene readings for every scene in which your character has dialog. Or, create scene readings of your own with one or more scenes, in any order. ACTING PARTNER is very flexible. You can hear any combination of the action, all the dialog including your lines, just other character's dialog or just your cues. And, you can easily identify a section of a scene you want to work on and repeat it over and over until you've nailed it. IMPORTS ALL REVISIONS - WITHOUT LOSING YOUR CHARACTER PRESELECTS.